"There's a lot of people that never seem to be happy unless they're making trouble for somebody." 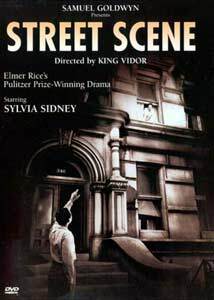 Street Scene was directed by King Vidor from Elmer Rice's script, adapted from Rice's own Pulitzer Prize-winning play. The film focuses on the ethnically diverse residents of a New York City apartment building, where the lonely Mrs. Maurrant (Estelle Taylor) begins an affair with milk bill collector Mr. Sankey (Russell Hopton). As the nosy neighbors (including Beulah Bondi as Mrs. Jones) gossip and kibitz, daughter Rose (Sylvia Sidney) tries to protect her mother from public disapproval and the wrath of her father (David Landau). The film's stage origins are obvious here, with nearly all of the action taking place in front of the apartment building—lines are delivered from windows and doorways, exits and entrances are always to the sides or through the building's front door, and intimate scenes are played primarily on the front stairs. Still, the film opens up the environment in significant ways—it begins with a skillful montage of street life, a huge crowd gathers in the street during one dramatic sequence, and King Vidor's camera dollies and zooms with abandon despite some shaky 1930's technology. The performances haven't aged as well as the filmmaking—the strenuously "ethnic" Norwegian, Italian, Yiddish and German accents are almost uniformly unconvincing and occasionally embarrassing, and some of the line readings are stilted and stagey; this is the kind of acting the Stanislavski/Strasberg "Method" rebelled against, and its shortcomings are often in evidence here. Still, Street Scene retains much of its impact, thanks in no small part to young Sylvia Sidney's sensitive performance as Rose, the teen-aged daughter who must restrain her emotions to do what's best for her family. The film's basic story is one of intolerance and mistrust, but Rose's story is more complex—she must make difficult decisions, and the film bravely retains the play's violence and its mature, bittersweet, decidedly non-pat ending, a major commercial risk at the time (or today, for that matter). The play is not often revived today, presumably due to its "Stereotypes of All Nations" characterizations and the more well-known musical version adapted some fifteen years later by Elmer Rice in collaboration with Kurt Weill and Langston Hughes. This film edition of the original play is therefore doubly important, preserving the play's content (and much of its staging) in a historical context; it's both a compelling narrative and an oddly hope-inspiring reminder of the not-so-long-ago day when Norwegians and Italians just couldn't seem to get along. Image Transfer Review: Image presents Street Scene in its original 1.33:1 full-frame theatrical aspect ratio. The source print is in middling condition even allowing for the film's 1931 vintage, with almost constant scratches and dirt flecks, several splices and a third reel that's visibly darker than the rest of the film. Still, the DVD transfer is impeccable given the source—every nick and scratch is clearly visible, and the film's gray-scale photography is rich and detailed. As much as it would have been nice to see the film in a restored state, this is quite watchable despite the print's condition. Audio Transfer Review: Street Scene features an authentic Dolby Digital 1.0 monophonic soundtrack. The film's age shows here, with fairly constant hiss, "buzziness" and low-frequency rumble picked up by the early Western Electric microphones; the print's condition causes a few dropouts as well. Allowing for the source, this presentation is quite solid—dialogue is almost always clear and comprehensible, and the incidental music score conducted by Alfred Newman is evocative if limited in frequency range. I've definitely heard worse audio on films of the 30's, and this track delivers where it counts. Extras Review: Unfortunately, the Street Scene DVD provides no supplements other than 11 picture-menu chapter stops. Given the age of the film, it's not surprising that no documentary footage or trailers were available; still, it would have been nice to see some textual information on the cast or the original play which inspired the film. Just barely above "F" territory. Street Scene holds up remarkably well as a portrait of ethnic conflict and family stress in the New York City of 1931. Image's DVD presentation features no supplements whatsoever, but the digital audio and video are impressive given the age of the film. A little melodramatic and stagey, perhaps, but its point is still valid almost seventy years later.